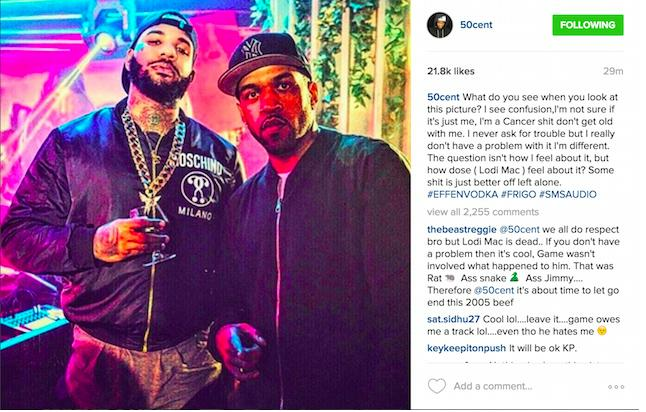 50 Cent has hit out at The Game after the West Coast rapper linked up with G Unit member Lloyd Banks. The Game made it clear on Instagram that his beef with Lloyd Banks was in the past, posting a picture of the two together in Dubai captioning the post "Still". However 50 Cent, who has been feuding with The Game since 2005, made it clear he was not happy with Banks. 'What do you see when you look at this picture?” asked 50 in a now-deleted Instagram post. “I see confusion,I’m not sure if it’s just me, I’m a Cancer s**t don’t get old with me. I never ask for trouble but I really don’t have a problem with it I’m different. The question isn’t how I feel about it, but how dose ( Lodi Mac ) feel about it? Some s**t is just better off left alone". Although The Game has recently been trying to reconcile with 50, the New York rapper shut down any potential make-up immediately, claiming he would never be friendly with The Game. Meanwhile, The Game has also offered to give Kanye West $10m, after Yeezy claimed he was in $53m debt. The rapper offered to help Yeezy under the condition that he would fly to Dubai and jump out a plane for charity.